We took our maiden voyage on the Eurail rumbling up to Pompeii, enjoying the chance to kick back and watch the Italian countryside pass by. We had expected to land in a tiny little village, and were surprised at the scale of Pompeii, with its gardens and courtyards, temples and baths, boulangeries and cobblestone streets, and even a red-light district where Kama Sutra-like frescoes cover the whorehouse walls. 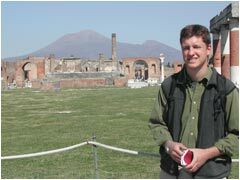 We sat on the stone benches of Pompeii's stadium and imagined watching a gladiator fight with Mt. Vesuvius looming in the background. 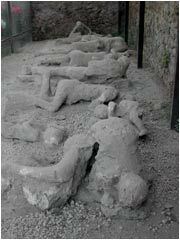 The most memorable part of Pompeii was seeing the plaster casts of the bodies that were found preserved under the volcanic rubble, like people frozen in time. Unfortunately, the ticket booth had run out of English guidebooks, and we couldn't afford the handy handheld audio guides, so we trailed behind a few English-speaking tour groups, eavesdropping in an attempt to comprehend the full wonder of what we were seeing. Twenty percent of the town of Pompeii died when a black cloud of volcanic dust overwhelmed the city — sending it into pitch blackness for days. The 20% of the people who died weren't able to find their way out in the dark, and eventually succumbed to gas inhalation before being buried in lava. We tried to imagine how quickly and unexpectedly this must have happened, and how easy it is for an entire civilization to be suddenly stamped out, as we gazed upon the pots, pans, urns — and even pigs — that were later unearthed. We speculated about what our Pompeii might be (nuclear holocaust? biological warfare?) and wondered for the second time on our trip whether future generations of tourists would someday be visiting the ruins of New York City or L.A. With that chilling thought, we got back on the train and rolled up to Rome.